Is it really over? I can’t believe it actually is! We had so much fun on the road. I think it’s safe to say The Magician’s Daughter album launch tour was our best yet. We sold out almost every show and we were blessed to be greeted by warm and amazing people like you. Thank you. It means so much to share our music and Brautkleider Billig und Festliche kleider online laughter with you all. Each and every show, it is you that makes it worth it. But before I get the better of myself with all the sentimental thank yous, how about we give you something you’ve all been waiting for? We’re so proud of this clip, filmed with the gorgeously crushable Spender and now we can finally share it. 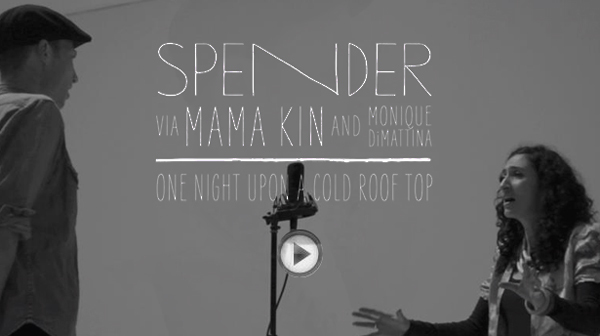 Ladies and gents, we give you: One Night Upon A Cold Roof Top by Spender via Mama Kin and Monique di Mattina. The video experience! it was a delight to record. Enjoy it lovely people. Now we may be taking a short break, to catch our breath and re-group post-tour. But there is no rest for the wicked, people! I’m setting off to the US for some songwriting adventures and will perhaps sing a song or two on stage with my man as he tours North America. Looking forward to some northern hemisphere sunshine. We then have some exciting festival announcements and a special show or two in summer. Let us know where you want us to play as we’re just finalising our tour route now. We’re also brewing a new single and video clip and will reveal all as soon as we can. I’ll see you all again soon. In the meantime I am loving the outlook of some extended time at home with my precious ones. I hope you are loving up the ones you love. Thanks again, so much, for your incredible support of The Magician’s Daughter. Here is to you and an abundance of magic in your life. To celebrate the final few shows, we have a couple of exciting announcements. I can’t believe The Magician’s Daughter caravan is about to come to a stop. What a tour we’ve had. So many smiling faces, so many wonderful places…alchemy and magic at every port. Thank you, truly, from the bottom of my heart for coming out to see us in the far-flung corners of Australia. And for those of you we are yet to see, can’t wait to rock the final few shows. Bring it on WA – go you hometown good things and my people of the south-west! And as for you Melbourne, cannot wait to return and test the waters at the Caravan Music Club. Come and say HI! Lovely fellow lady of the west Ruby Boots has just been added as the first support for our Fly By Night show on May 30. Don’t miss this woman playing solo. Gorgeous Spender also joins us for the last shows in WA – we’ll be sad to say goodbye. You are in for a treat people of the westside. For our recently added Melbourne show – June 6 at Caravan Music Club – we have the spectacular Jess Ribeiro & the Bone Collectors opening for us. So hot! BUT…most excitingly…we have a hot new competition with prizes GALORE to say thank you for showing us so much love on the road. Ladies and gents, we present the Magic Moments competition. All you have to do is upload a pic that defines your “Magic Moment”, share it with your friends and encourage them to vote for your entry. We’ll have a people’s choice prize and I’ll select my favourites too. I love magical pics! Cannot wait to see yours. Thanks again for making us all feel so loved and supported. PS I had so much fun presenting Roots N’All on triple j last Monday. If you missed it, check the podcast for roots soul and folky goodness. It’s online until the next broadcast on Monday night.